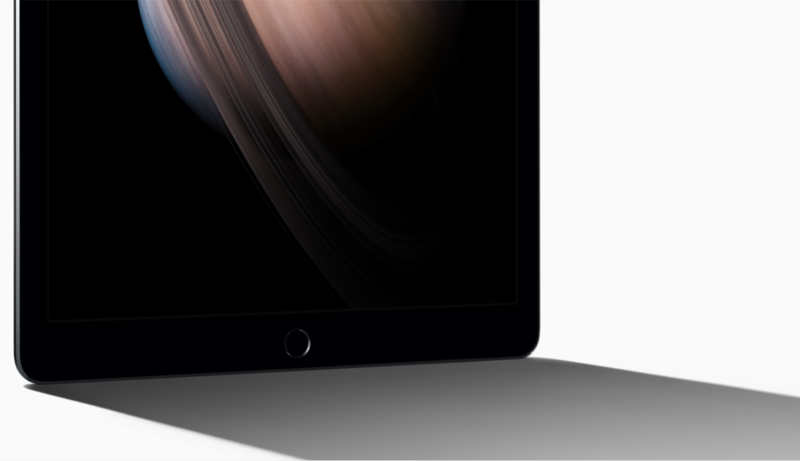 The gigantic 2732×2048 display on the iPad Pro was really brought to life by the demos during Apple’s Keynote. Microsoft and Adobe had some great use-cases for getting “real” work done quickly and efficiently through the use of split-screen apps. Copying tables and charts out of Excel and pasting them into Word looked easy, but it was Adobe’s presentation was even more efficient. They seem to have built “send to” features right into their apps, so you can take the currently selected image and send it straight to one of their other apps, without dealing with any extra pop-up menus. Short of dragging and dropping right across the app thresholds, Adobe seems to have the right idea about how a 12.9-inch display can be utilized. The four speakers — which adjust to the iPad’s current orientation — are definitely a “finally” moment for anyone who watches video on the iPad. It’s far too easy to block the grill for the stereo speakers on the Air 2, should allow you to hear your audio without compromising your hold on the tablet. Apple also says the speakers are now 3x as loud, which is quite impressive given the thinness of the device. There were also some surprising extra details in Apple’s announcement. The iPad Pro is 1.57 lbs, which means it’s more than 50% heavier than the iPad Air 2. That makes sense given the larger, higher-res screen and the bigger battery required to poewr it. However, I find that one pound is my threshold for comfortably holding a tablet, and it’s why I found everything before the iPad Air difficult to use in the way that Apple describes in their media. I think the iPad Pro is incredible, but that its weight will hold it back from long term usage in your hands. It sounds more like a device you set down on a desk or place on your lap. One of the first things I saw during the iPad announcements were three dots on the side, which together make up Apple’s new magnetic Smart Connector. This is what powers Apple’s new Smart Keyboard (which we’ll detail in another post). However, the connector also warrants mentioning because it provides two-way power. This could enable things like magnetic trickle charging or even magnetic microSD card readers for the iPad, but it definitely means that certain device classes (like keyboards) will no longer require separate charging. Charging iPad keyboards has never really been an issue because they last for months at a time, but this change does mean that future keyboards can be made lighter by eschewing the battery. The iPad Pro was announced alongside two accessories, the Smart Keyboard and the Pencil (which is definitely unfortunate for FiftyThree). Rob will detail those in a post later today. I know, I know. It’s the classic tech writer thing to say something like “wait until next year”. However, in the case of the iPad Pro, I feel like there’s one key piece of technology missing before the iPad becomes the machine I want it to be: 3D Touch. 3D Touch, a re-branded version of the Force Touch tech introduced with the Apple Watch, is one of the key selling points of the new iPhones 6S. 3D Touch allows the screen to differentiate between a tap, a press (“peek”), and a deep press (“pop”). This tech isn’t available in this year’s iPad Pro, and I think it could make all the difference in typing comfort on the iPad. I’d like to be able to rest my fingers on the iPad’s software keyboard, but only have keystrokes registered when I actually apply force to the key (just like on a physical keyboard). 3D Touch would also bring more nuance to the iPad’s controls, which would enable apps like iMovies to perform more their desktop counterparts. The iPad Pro has the power, but finer controls will really bring it to the next level. This technology will come to the iPad in much the same way Touch ID did, but it will probably take a year. That’s all right by me because I’m still very happy with the Air 2’s performance, but the lack of that single feature is what’s keeping me from running out the door and upgrading right now. However, I am not without empathy, and I can see how this upgrade is a boon for artists and students. The extra sensitivity built into the screen is a very big deal for users who need accurate stylus input (something the iPad has always had to “fake” with special SDKs), and running two full-sized apps on the larger screen will be a great productivity boost. Overall, I’m happy to see Apple taking the iPad more seriously. Tim Cook has long been a champion of the iPad in the business world, and it’s great to see Apple’s design following through on his stance. Good points regarding the iPad Pro for a fellow user of the iPad Air 2. Everyone has different needs, but I think I will probably sit this one out. I also own the 12″ Macbook. So it is hard to justify the iPad Pro for me anyway.